Oh, what a book!I never thought a combination of history and politics could be so mesmerizing. I'd never been a fan of history in my school days, so attribute all my ignorance in that subject to the bland manner in which we were dished out history lessons. And, politics is a sphere I started to take interest in only recently. This book however kept me hooked on both levels. 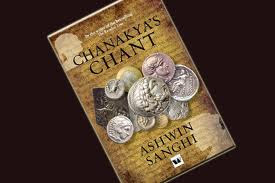 The novel is actually two stories set in two eras ( one set about 2300 years ago and the other in the present) but connected wonderfully by a single thread-'Chanakya neeti' that is used to achieve a desirable consequence in the given set of political mish-mash. The parallel narration does more than fine justice to the stories from both eras, without compromising on the pace which is fast and gripping. I eased my way in and out of the two worlds without any jerk (in terms of waning interest or losing the thread in the flow of the story)-a proof of sound writing, IMO. "The book begins in the year 340 BC, and shows how a young Brahmin boy is traumatized by the murder of his father. He decides to take revenge, and uses his calculating brain to plan it. Slowly, he becomes an expert political strategist and is known as Chanakya. He uses his skills to unify the country Bharat (ancient India). This unity, teamed up with his expertise, ensures that the army of Alexander the Great is defeated, and Chandragupta is crowned the king of the Mauryan empire. With time, Chanakya gets bored and decides to use his intelligence to pen down the Arthashastra. Chanakya's Chant then shifts into modern India, two and a half millennium later. It focuses on Gangasagar Mishra, a poor Brahmin teacher. It turns out that this man becomes a puppeteer to people. He witnesses how contemporary India is riddled with corruption, greed, treachery, and hatred. He realizes that in order to succeed in this society he too must indulge is such malpractices. However, Chanakya's Chant highlights the possibility that this man could be a reincarnation of Chanakya. Gangasagar plans to make a slum girl the Prime Minister of India." Interesting enough to grab a copy? Go ahead and you'll not be disappointed in all likelihood. And, do share your views if you've already read this one. i am currently reading it!!! time adjustment problems to find time to read it.. eager to finish off.. first time i am reading a political thriller..
oh, wow. I had been meaning to read it for a while now, but only just managed to get hold of it. Been wanting to read it for long now. Currently reading The oath of the Vayuputras. Your review inspires me to pock this up next. Go grab a copy after this one...Btw, how do you find The oath of Vayuputras? Have been longing to read this book for so many months now. Now I feel I should grab it right away :) good review. Oh, you must read this, Jas. I think you'll like it. I remember the Chanakya serial that used to come on TV. The book does seem to be an interesting read! It is, Jayashree, do read it if you get a chance. Maan gaye ustaad !!! The book was awesome...ending thodaa fizzle out kiya but all in all a fabulous read!